Garlic Basics - Fall is Garlic Planting Time!!! Garlic is easy to grow since most of its time in the ground is during our rainy season and, after you mulch it for winter, can pretty much be ignored. About the time the scapes (flowers) begin to develop in spring, the weeds start to grow and need to be removed as garlic does not develop well with all that competition. Have you ever eaten garlic scapes? Since you have to remove them when they begin to curl, you might as well cook them. Grilled or sautéed, they have a nice, mild garlic flavor. Just use the tender part as you would asparagus and they store in the fridge at least a month. Back to the garlic bulb, here are the basics. We sell 2 types of garlic – hardneck & softneck. Hardneck garlic usually has larger cloves, which are easier to peel, but they don’t store a tremendously long time. Softneck garlic has a larger quantity of smaller cloves, they’re a bit harder to peel, but they keep a long time. These are also the ones you can braid & hang in your kitchen. I usually plant both types, using the hard necks first. Garlic is planted in the fall. Separate the cloves but you don’t need to remove the papery skin around each clove. Plant, pointy end up, within 5 days, at a depth about double the size of the clove. Deeper if you’re in a very cold location. Water-in and moisten frequently till the rain starts. Once the soil cools off, mulch with a few inches of rice straw. That’s it for fall. When the soil begins to warm in spring, watch for the growing tips. (Sometimes they’ll start in the fall if you plant early and the soil is still warm.) Cover with more straw to protect from frost – you may need to do this 3-4 times. This is also the best way to keep the weeds down. Harvest when about ½ the leaves turn yellow or brown. This usually happens in my yard about the end of June, but this year its about 2 weeks later. Stop watering so the soil can dry a little. Don’t leave them in the ground too long after you stop watering as the papery skin will start to deteriorate and the bulbs won’t store as well. Try not to poke them with your digging fork as this can introduce disease and again, affects storage. Place them in a cool, darkish location to cure, usually about a month. We have a huge, low-limbed butternut that shelters our garlic. If curing outside, be prepared to cover your garlic with plastic if it rains. It seems like it always rains once in July, after we’ve harvested. If you want to taste your garlic while its still green, you can, just not with Elephant Garlic. Once cured, keep in a cool, dry location, inside. Yes, garlic freezes and turns to mush. Enjoy your garlic. Not only does it taste good, but it’s good for you! Roses are like people – some just have nicer hips than others. Some have pretty faces, some have great legs, great shoulders. Some have good hips - especially in October. And I like good hips. To me, they speak of strength, fertility and beauty. 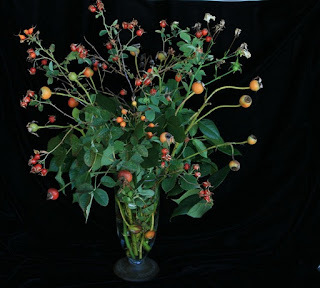 Autumn is the best time for the widest variety of fully-formed, voluptuous and vibrantly-colored rose hips in the garden, in arrangements, in recipes and in photographs. Roses will set fruit throughout the growing season, as evidenced by wild roses, if given the chance. However, we rose growers can be so vigilant about picking flowers or deadheading to encourage repeat bloom, that it’s often not till the end of the season when we’re advised to stop picking in order to harden our plants off for winter that we give our plants a chance to form their lovely hips. Autumn’s cooler nights, cooling soil, and shorter daylight hours likewise signal to all of our plants that it’s close to the end of their seasonal chance to get the job (reproduction) done and set seed if at all possible. 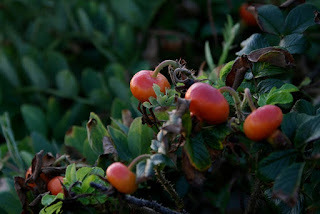 Rose hips are, after all, the fruit and seed of the rose and two things are required in order for a rose to produce hips. The first requirement is that your rose is not a sterile cultivar, which would preclude it being able to produce seed. The second requirement is that your fertile rose is successfully pollinated, which is what will trigger fruit/seed formation. As seed structures, much like their relatives the apples, rose hips are a mass of small flatish individual seeds, called ‘achenes’, all bound together in the soft, sweet flesh of the colorful hip. The flesh of the hip serves multiple purposes, both protecting and even nourishing the seeds inside while they are developing. Furthermore, brightly-colored-when-ripe hips stand out, providing an attractive offering to birds and mammals (such as bears and people). The colorful fruit entices animals to pick and eat or process the flesh. Because the seeds inside are fibrous and hard, they pass through the intestines of most birds and mammals, and are by- and -large discarded by people. When a seed passes through a bird or mammal’s digestive tract, the highly acidic conditions help to process the durable protective layer surrounding the inner seed. This ‘stratification’ or ‘scarification’ allows the seed to germinate more easily once it finds itself in welcoming ground. Finally, if not picked and processed by hungry, predatory creatures, the ripening and then breaking down of the hip’s nutrient-rich flesh over the course of the seasons will also serve to stratify the inner seeds. Whether the seeds have been passed through the gut of a bear, through the crop of a bird, spat out by a person, or been allowed to age on its stem or on the ground nearby, all of these pathways lead to the hip’s whole intended purpose: the safe dispersal of the seed. While all seed-bearing plants, which roses are, are genetically designed to set seed and attempt to reproduce, some roses do in fact set hips more easily and abundantly than others. 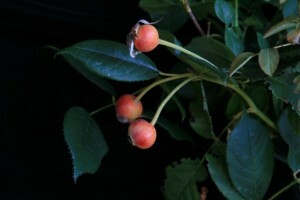 Species roses – including the rugosa roses, which are famed for their fat, fleshy, apple-like hips – produce perhaps the best hips. Single, and more open-flowering doubles and semi-doubles are also likely to produce good hips because they are pollinated with relative ease. According to some sources, very tightly and profusely-petaled rose forms can be difficult for insects to pollinate well, can have that dense-petal formation at the expense of stamen and other reproductive parts, and are more likely to be sterile hybrids, and therefore might not produce hips consistently. Although, according to Karl Bapst, American Rose Society Master Rosarian, some of the rugosa hybrids are the most densely -petaled and produce the best hips, so dense-petals equaling poor hips is not a hard and fast rule. 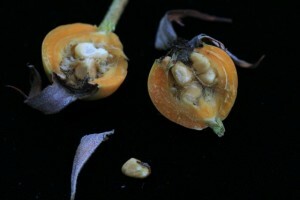 Successful pollination triggers good fruit set. If you want good hips, then you need good bugs. So your best bet is to avoid pesticides – particularly broad-spectrum pesticides. Although you might want to only harm insects you worry are damaging your roses, any pesticides are also likely to be killing or impairing your pollinators. 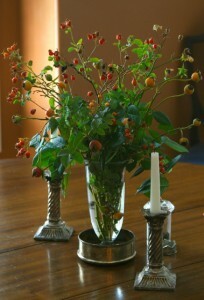 Cut stalks of hips can make wonderful displays – combined with more complex floral arrangements, or on their own. 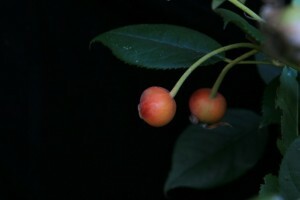 Placed in water, stalks of fresh hips will generally remain plump for about a week. Dried hips are also very attractive and will hold on the stem for a very long time. 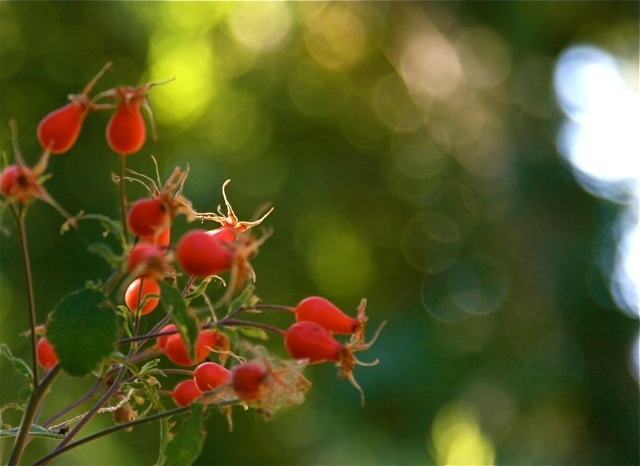 Rose hips have a rich history of culinary and ritual use. Noted by nutritionist as being a “good source of Vitamin E (Alpha Tocopherol), Vitamin K, Calcium and Magnesium, and a very good source of Dietary Fiber, Vitamin A, Vitamin C and Manganese”, many cultures have used rose hips to make tea, jelly, wine and even to eat as a dried fruit. The term rose hip linguistically comes to us from the Old English “heope” or “hiope” and alternative forms are rose hep and rose haw. It is said that early Catholic monks used dried hips of wild rose to create the first rosaries – using each hip to keep track of their required number of prayers said. 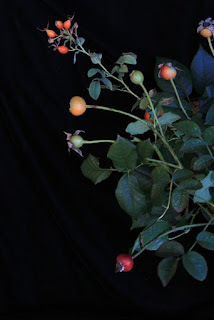 I like the idea of marking spiritual significance and prayer through the nurturing beauty of rose hips in the autumn garden - a spot full of grace indeed. This article originally appeared in the Butte Rose Society’s October 2011 Newsletter. I love all forms of food preservation. I also love reducing my environmental footprint whenever possible. 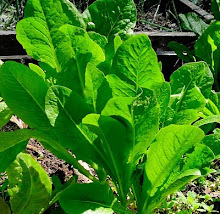 I’ve often thought about the energy involved in canning, freezing and using my electric food dehydrator to save my summer garden harvest for wintertime eats. For me, a solar food dehydrator is the best of both worlds: I can dry food using the free, renewable energy of the sun (unlike the energy needed to boil water for my canner or run my electric food dryer), and my resulting dried food can be stored without any added energy (unlike the frozen foods in my freezer). 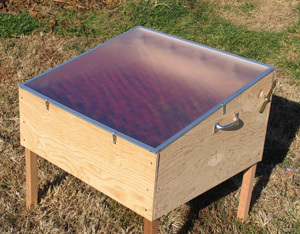 A solar food dehydrator would allow me to literally save a bit of summer’s sunshine for the short, dark days of winter. I’ve studied and dreamed about the plans on our site to build a solar food dehydrator for a couple of years now, but I was always stymied by my lack of DIY skills. Luckily, I got the opportunity to try my hand at building a SunWorks Solar Food Dryer Kit. All the pieces came in one large box, I had step-by-step instructions at hand and a short list of other tools (all with names I recognized and could find at home) to help bridge my DIY-skills gap. All told, building this solar food dehydrator took me about 5 hours. (Let me be totally honest here: I had never used a staple gun, changed the bits on a drill or used a spline roller before, so it could take someone with these skills already under their belt less time.) I only had minor confusions while reading the instructions, which were easily cleared up by our resident DIY editor, Robin Mather, and Hank Will, Editor-in-Chief of Grit magazine and super-experienced handyman. I still swell up with pride just looking at the completed food dryer, a sentiment many of you DIYers are familiar with, I’m sure. Solar Food DehydratorAnxious to test out my handiwork, and hopeful despite the short, cool days we were already experiencing here in mid-October, we set the solar food dehydrator out on Oct. 24, at 10 am. Fellow editor Heidi Hunt and I halved a large bowl of cherry tomatoes (snacking on a few in the process), loaded the dryer racks, tilted the back vent open and left the food dryer facing South toward the sun and warmth. 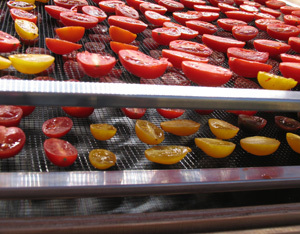 Within only an hour, the food dehydrator reached an internal temperature of 120 degrees Fahrenheit, a high enough temperature to start turning our cherry tomato halves into delicious sun-dried tomatoes. It continued to warm throughout the day, reaching over 140 degrees by 1 pm. The tomatoes were visibly drier at the end of the first day, and by the end of the second day we were well on our way to a successful batch of sun-dried tomatoes. The third day, however, rain, clouds and much colder temperatures set in, and by the end of the fourth day (still cold and somewhat overcast), we saw the beginnings of the end: mold spots. I’m still excited to put our solar food dehydrator to work next summer, when the warmer, longer days with much more direct sunlight will kick our solar food dryer into high gear. Plus, the few bites of nearly sun-dried tomatoes that we snuck throughout the process were well worth the late-season attempt!